Meet the man that knew Padre Pio personally! Once in a lifetime event coming to the USA. Adolfo Affatato today, and above as a young man in his 20's with Padre Pio. He met Padre Pio when he was 16 years old. Padre Pio called his name out of a group of men and told Adolfo "I have been waiting many years for you". This man chosen by Padre Pio is now coming to the USA to share the words, wisdom and prayers of Saint Padre Pio. He is one of the last people alive today that had an extended personal relationship with Padre Pio. Don't miss this once in a lifetime opportunity to hear first hand from the man who has devoted his life to this great saint of the Catholic Church. All dates are listed below. A Padre Pio glove will be at each presentation. Adolfo Affatato: One of Padre Pio's last remaining spiritual children, sharing spiritual and life stories about this great saint. Memoirs of A Spiritual Son. Adolfo will share personal stories and wisdom from the book about his 15 years with Padre Pio. ​These are amazing stories you will not hear anywhere else. ​An actual glove worn by Padre Pio will be at these events. A personal 'meet and greet' and book signing will be held after each event. 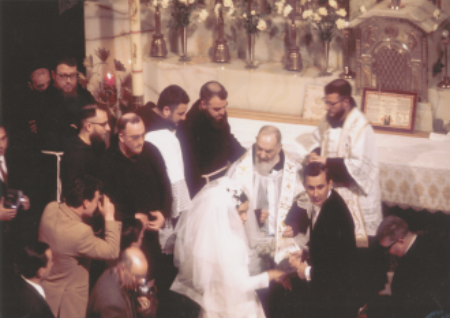 1966, Padre Pio's last wedding. Adolfo: "Padre Pio, will you promise me that you will bless everyone I present to you?" Padre Pio: "Yes, now and when I'm gone." Who is Adolfo Affatato? Adolfo Affatato, now 82, met Padre Pio at age 16, Since that day in 1953, Adolfo has been devoted to Padre Pio. Now he brings his story, devotion and the wisdom of Padre Pio to Americans for the first time. Hear how his 15 year personal relationship with Padre Pio changed his life. As one of only 2 spiritual children still alive today that knew Padre Pio personally, this is a once in lifetime opportunity to hear and meet a personal, close friend of one of the greatest saints and mystics in the history of the church. Padre Pio changed Adolfo's life at that first meeting in 1953. Hear that story and more at his program. Not only did Adolfo know Padre Pio on a personal level, he also met privately with another great saint, John Paul II. Because of John Paul's devotion to Padre Pio, John Paul would ask Adolfo to meet him personally one-on-one to tell John Paul more about Padre Pio. Adolfo's stories of Padre Pio could change your life. Adolfo Affatato is presenting in only 3 US cities: Tampa Bay, St. Louis and Atlanta. Complete schedule of Adolfo's visits are listed below. Adolfo and his wife, Franca, have been married for 52 years and have two children. They live in Foggia, Italy. Adolfo has made hundreds of presentations about his life with Padre Pio over the past 50 years. He receives no stipends or compensation of any type for any of his talks. He covers all of his own expenses, including travel and hotels for his USA travels. He says if he accepts any money for his talks about Padre Pio that it would void his testimony. Any profits from his book Padre Pio and I goes to charities he has selected in Italy. His book is full of personal stories about Padre Pio you will hear no where else. At his presentation, he will discuss his first encounter with Padre Pio, his wedding performed by Padre Pio, and the Guardian Angel story that will be one to remember. Make plans now to attend one of these events to hear and meet one of the last remaining men alive today that had such a close personal relationship with Padre Pio for 15 years before the saint died in 1968. Listen to an amazing journey through the last 15 years of Padre Pio’s life as witnessed through Adolfo Affatato, spiritual son of the great saint. His stories will amaze and inspire you. A First Class Relic will be present at each of these events, one of the gloves worn by Padre Pio. Adolfo is one of the last two people alive today that knew Padre Pio personally as a spiritual child. Adolfo Affatato events scheduled for the USA.